But this time it looks set to be a joint venture between Everton, Knowsley Borough Council and Tesco. After the King's Dock debacle and Liverpool City Council's u-turn over Stanley Park, “Actually, you know, it probably can be built on after all”, it appears that Everton are looking to leave the city in order to get the super stadium they need. Quite how the major regeneration initiative will actually involve us if it doesn't provide us with a new home is unclear though! In fact, pretty much everything surrounding the proposed move is unclear. The only thing that has been made certain is that the club will be leaving <?xml:namespace prefix = st1 ns = "urn:schemas-microsoft-com:office:smarttags" />Goodison Park at some stage in the next few years. 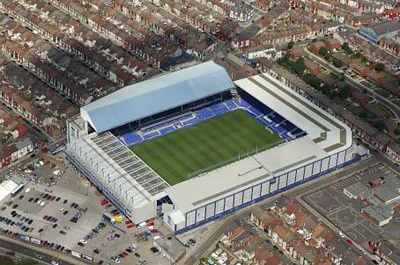 The club has apparently been told by Liverpool City Council that it was "absolutely impossible" to extend the footprint of Goodison. The club are also stressing that the final decision on the new site has not been taken and the fans will be consulted at some stage. But quite why or how we will have a say is a bit of a mystery as I can't see all three parties putting time and money into securing a new site only to be told by the people that matter the least these days, the fans, that we don't want to go there! On a personal level Kirkby, is only four miles but a positive lifetime away from Goodison and I am already having serious reservations about whether I want to want to watch my team at the Tesco Arena. And if it makes the matchday experience anything like going to the Reebok Stadium every other week then count me out!